I have always allowed myself to dream. It’s the only thing I know how to do well. The world is dark, as dark as night. With rare moments of illumination. But more often than not, those come few and far between. The weight of my insurmountable past chokes and stifles. Like the strangler fig, devouring one breath and consuming the other. The more you fight the more it constricts. And so, I release. Even flowering can happen in the dark. I’ve always said that my body operates within an instinctual continuum of transformation. Shifting into new being is the thing I do best. It’s a consequence of being born under the multiplicity of stars, and one I hope to forever surrender to. There’s a thrill that comes with the descent. A new beginning, a new perspective, a new love, a new obsession. A new thing to fall into complete and utter consummation with. And falling is happening now more than ever. I’ll be travelling up until the course of January. And the instability has left me both fervent and anxious in anticipation. That very same stain of anticipation has me shaking with deep affliction. I can forever hate the instability, I can forever hate the unknown, but I can never regret licking the reward of such sweet, wild, honey. And onto these Pistachio CustardMorning Buns. I’ve been meaning to create a morning bun for a while now, but the creation of croissant dough proved laborious enough as a deterrent. I’m under no illusion that we all have hours and hours to spend on making it from scratch. Enter this Morning Bun. It’s comprised of a dough inspired by Claire Ptak’s Cinnamon Buns in the Violet Bakery Cookbook, which utilises the assistance of baking powder and a quick-style method so far removed from the folds and turns that encompass the nature of croissant dough. The result is a Morning Bun that's equal parts flaky pastry and yeasted bun. 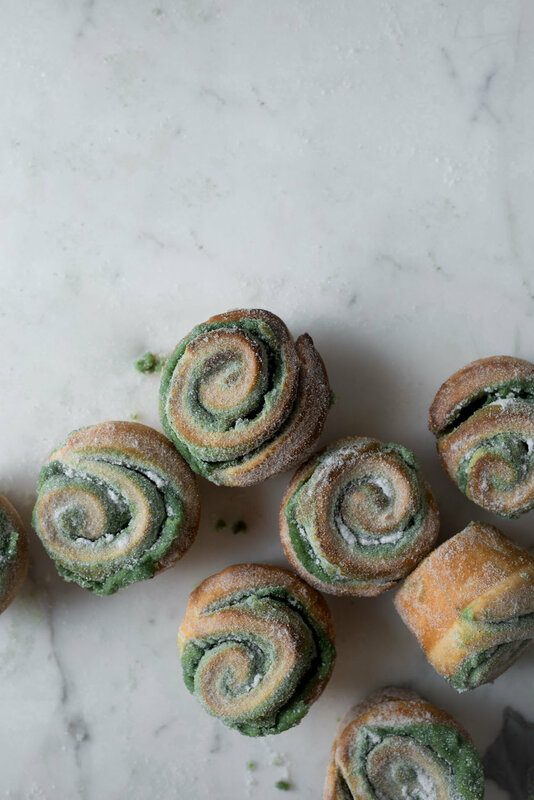 Between the folds of dough is a custardy pistachio flavoured crème patissiere, which is both sweet enough to sate and mellow enough to compliment all the surrounding flavours. There’s a hint of orange blossom and cardamom within. Vanilla too. And a heavy scattering of sugar to finish. Make sure to use very cold butter for the dough. You want the butter to partially retain its shape in order to achieve a flaky and soft dough. Place the whole milk, heavy cream, orange blossom water and vanilla bean seeds in a large saucepan set over medium-low heat. Heat, until the mixture is just beginning to reach a gentle simmer. Make sure to stir it occasionally. Meanwhile, whisk together the egg yolks, granulated sugar, cornstarch and salt until the mixture is pale and just under doubled in volume, about 3 minutes. Ladle a little of the hot cream mixture into the whisked egg yolk mixture. Whisk vigorously to combine and acclimatise the eggs. Pour this mixture into the saucepan with the remainder of the cream set it back on the stovetop. Continue to whisk, for a further few minutes, until the mixture has thickened up considerably. Do not let the crème patissiere come to a rolling boil otherwise it will curdle. Simply keep it on controlled- low heat and make sure to constantly whisk until it thickens. The crème patissiere is ready when it is thick enough to coat the back of a spoon. Remove it from the stove top and stir in the pistachio paste. Place a fine mesh sieve over a large mixing bowl. Strain through the crème patissiere, making sure to use a rubber spatula to help ease and press it through. Immediately cover the bowl with a layer of plastic wrap, making sure that the plastic touches the surface of the mixture. Set the bowl in the refrigerator to chill the crème patissiere, about 4 hours or overnight. Combine the all-purpose flour, granulated sugar, baking powder, ground cardamom, orange zest and salt in the bowl of a stand mixer fitted with the beater attachment. Beat to evenly combine the dry ingredients. Set the mixer speed to medium. Add in the roughly cubed butter and beat until the mixture forms a coarsely textured meal. Some larger chunks of butter should run throughout the dough. Lower the mixer speed. Slowly stream in the milk. Beat until the dough is beginning to form a ball around the base of the beater blade. Some dry floury bits may remain at the bottom of the beater bowl. Stop mixing and turn the dough out and onto a lightly floured work surface. Pat the dough into a rough disc, incorporating any dry floury bits that remain from the bowl. Cover the dough with a layer of plastic wrap and let it rest in the refrigerator, about 1 hour. Pre-heat the oven to 180 Celsius. Generously butter a 12-cup muffin tray then set the tray aside. Place the granulated sugar into a medium sized mixing bowl then set the bowl aside. Remove the chilled dough from the refrigerator and set it out onto a floured work surface. Lightly dust the top of the dough with a little flour to prevent the rolling pin from sticking. Roll the dough out and into a rough rectangular shape, until it is about 5 mm in thickness. Adjust the dough as necessary to prevent it from sticking to the work surface. Remove the pistachio crème patissiere from the refrigerator then use the back of a metal spoon or a large rubber spatula to thickly spread it over the top of the dough. Starting with the longest top edge, begin to roll the dough into a cylindrical log, making sure to keep it tight and even. Use your hands to lightly apply pressure to the log to ensure that it is kept at an even thickness. Use a sharp knife or kitchen string to carefully slice the log into 12 even pieces. Neatly divide each piece the muffin tray. Bake, for 23 to 25 minutes, or until golden brown and fragrant. Remove the tray from the oven and let the buns cool for about 5 minutes, before carefully one-by-one turning them out and into the bowl filled with the sugar. Roll each in the sugar to evenly coat then set them aside on a wire rack to cool slightly before serving.